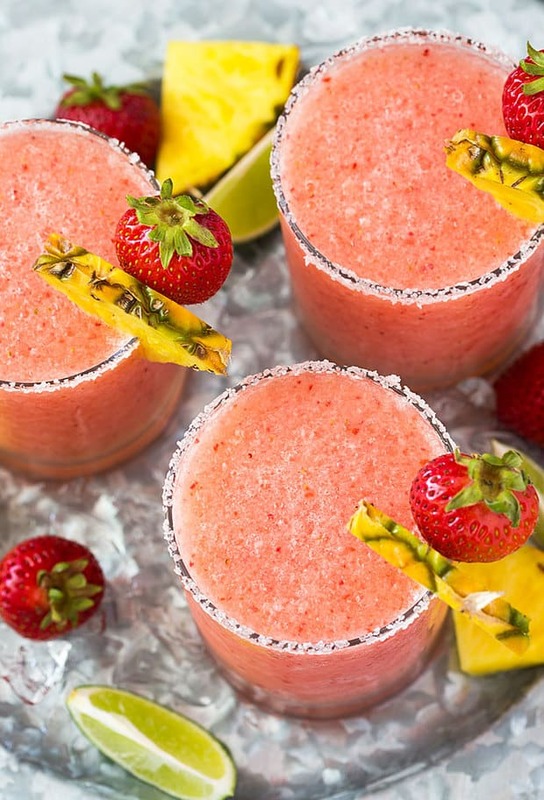 The Best Margarita Recipes are exactly what you and your friends need to cool off this Summer. The delicious flavors will have you completely in love! 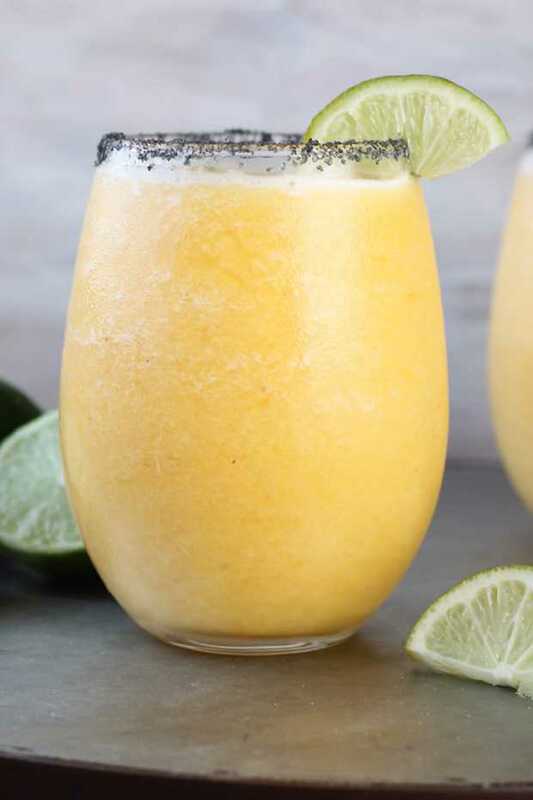 Amazing mango margaritas that will cure your tropical cravings. 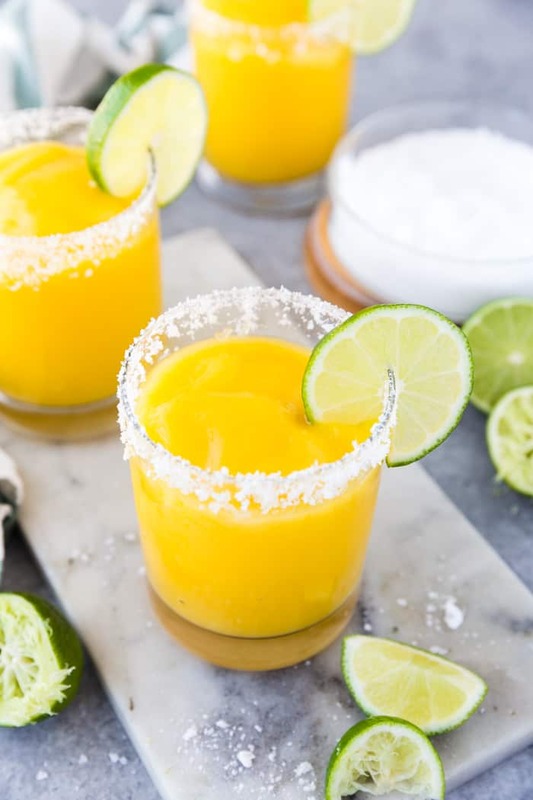 Orange and Pineapple Margaritas that are sure to be a hit among your friends. Smoky drinks that have delicious flavor. You are going to love these recipes! I have searched and searched and I think I have finally found the best of the best when it comes to these alcoholic drinks. The drinks in this list are some of my absolute favorite recipes and I am positive that you will love them! 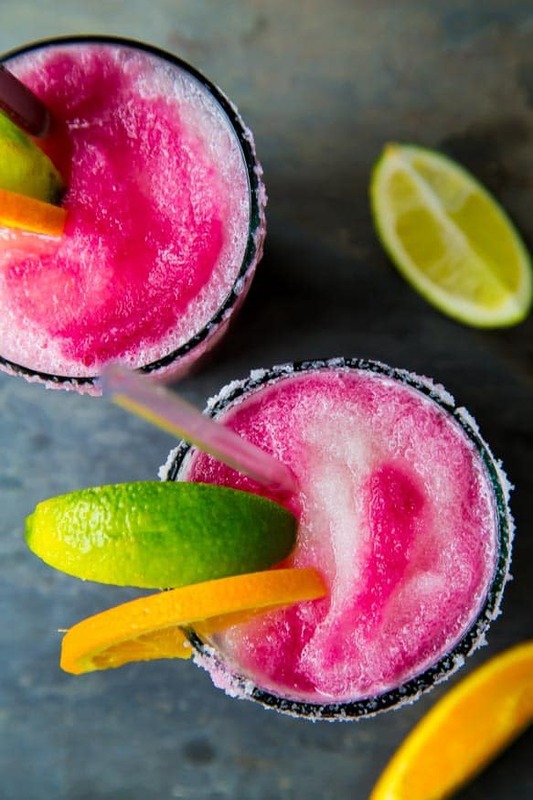 No matter what kind of flavor you are looking for, there will be something for you in the Best Margarita Recipes list. Included in this list are drinks inspired by the tropics. Solve your cravings with a refreshing mango, coconut or pineapple margarita. Maybe you are a pomegranate or berry fan. Well, you will find a drink that you will love here. There are seriously so many delicious drinks of so many tasty flavors here. 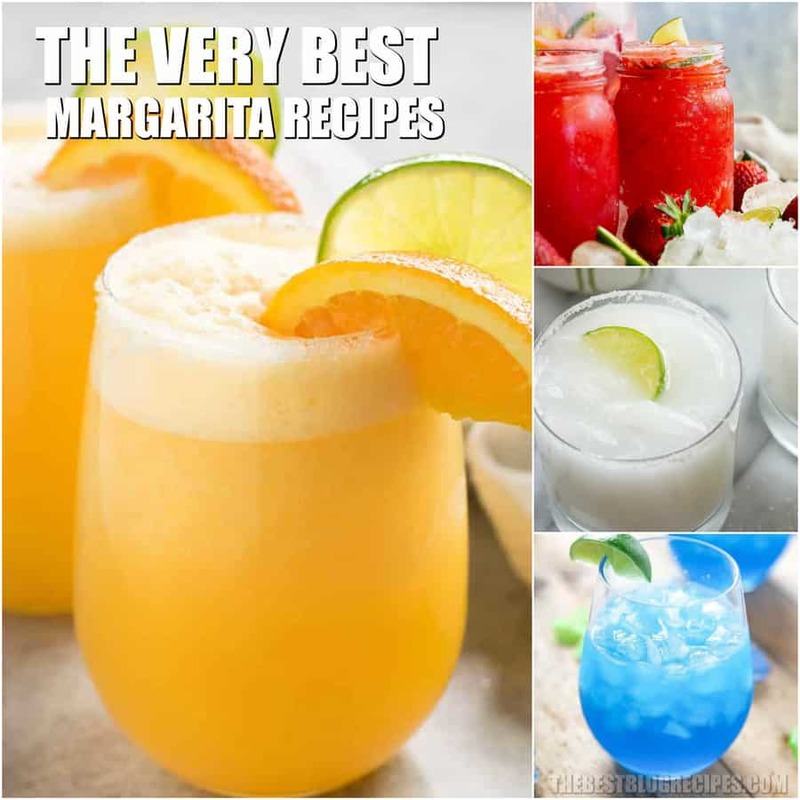 You will just have to decide with of the Best Margarita Recipes you would like to make first. Everyone I have ever served the Best Margarita Recipes to has loved them, and your friends and family will be no different. People will not be able to get enough of the amazing drinks in this list. 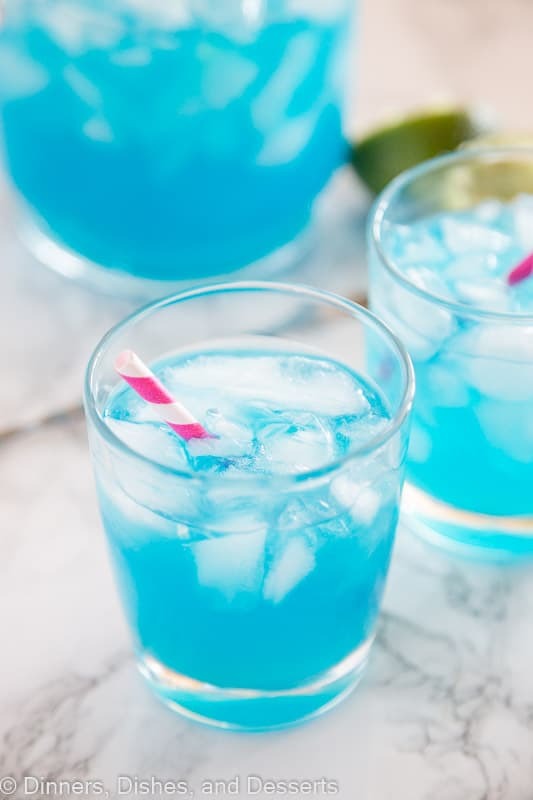 From Baking Beauty :: Click HERE for the RECIPE Blue Margaritas: These incredibly refreshing margaritas are SO easy!They only require 4 ingredients, and no blender/cocktail shaker! 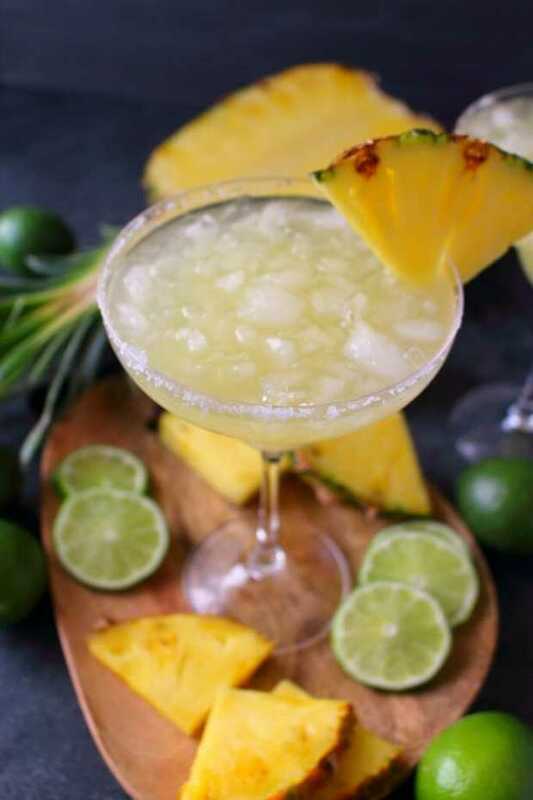 From The Blond Cook :: Click HERE for the RECIPE Pineapple Margarita – A sweet, tart and delicious margarita that is incredibly EASY to make! From Cake N Knife :: Click HERE for the RECIPE A Smoky Jalapeño Margarita is just the blend of smoky, savory and spicy to elevate your margarita game to all new heights. With an easy-to-make jalapeño simple syrup and a smoked chili sea salt rim, every sip is an adventure. Trust me when I say, you won’t be able to stop at just one. 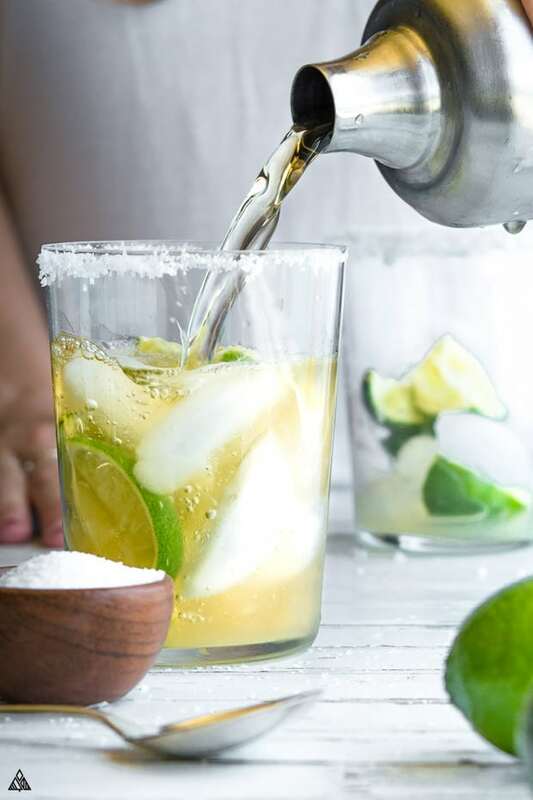 From House of Yumm :: Click HERE for the RECIPE Enjoy the refreshing taste of this classic margarita made with simple ingredients. No mix required! 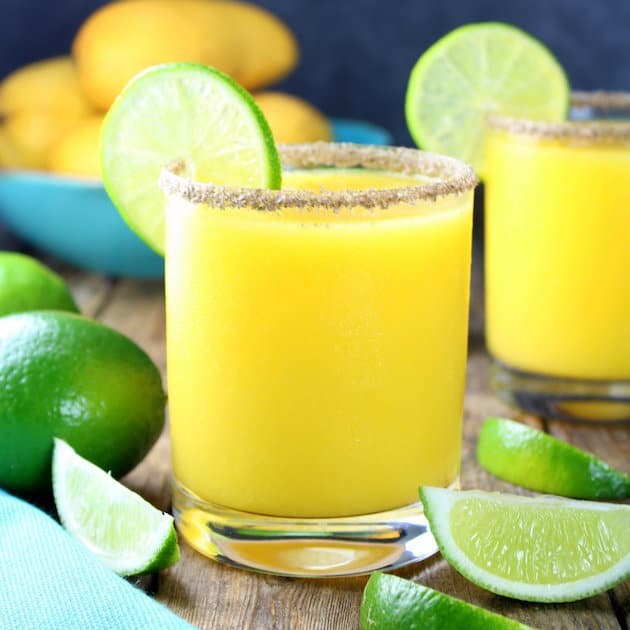 This simple margarita recipe is sure to become your favorite! 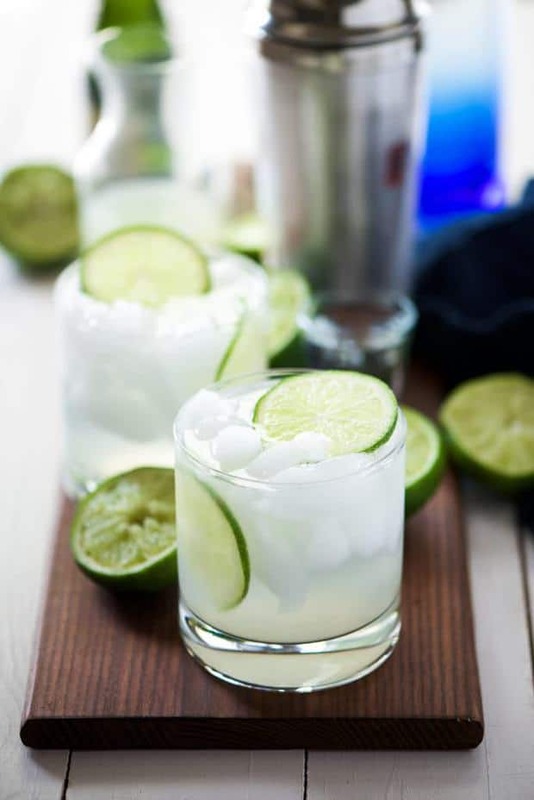 Made with fresh lime juice, agave to sweeten, and a combination of tequila and triple sec. This cocktail is easy to make at home! 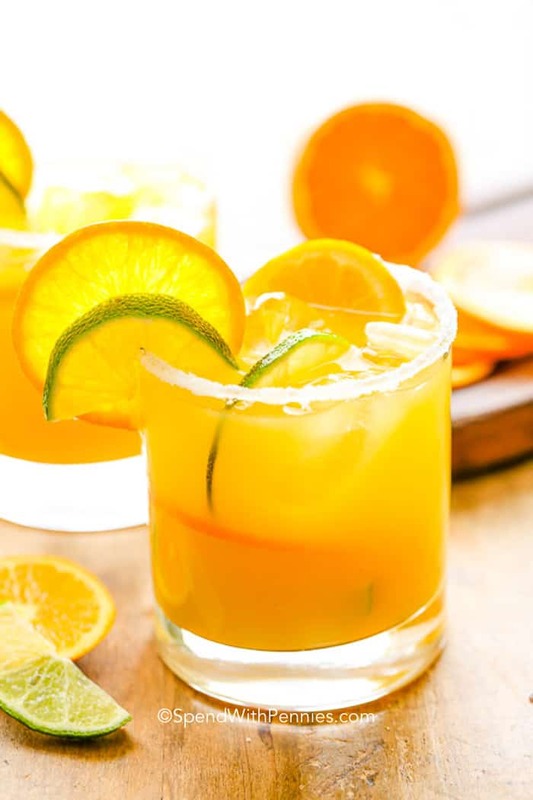 From Taste and See :: Click HERE for the RECIPE The Smoky Mango Margarita – your new favorite sipping sensation! It’s a little sweet from the mango, tart from the fresh lime juice, and earthy/smoky from the tequila and mezcal. The perfect libation for your next soiree! From Salt and Lavender :: Click HERE for the RECIPE This pomegranate margarita is fast, easy to throw together, refreshing, and delicious! It uses pomegranate juice, so this drink can be enjoyed year-round. Ready in 5 minutes! 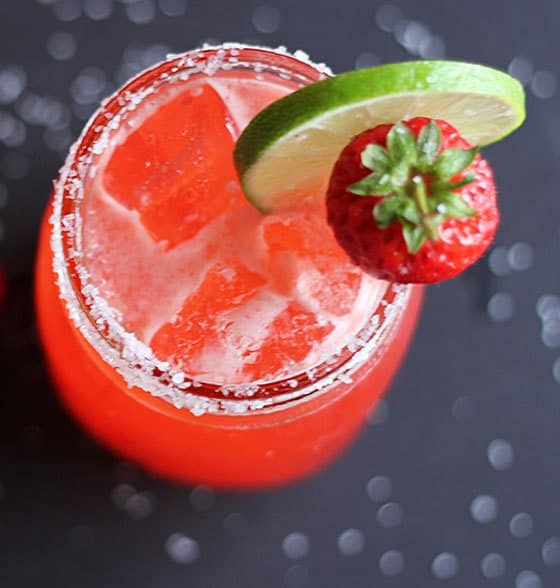 From Julie’s Eats and Treats :: Click HERE for the RECIPE Strawberry Lemonade Margarita is an easy and crowd pleasing drink! It’s ready in minutes when you use frozen lemonade even frozen strawberries if you desire. Make this Lemonade Margarita for your summertime parties! 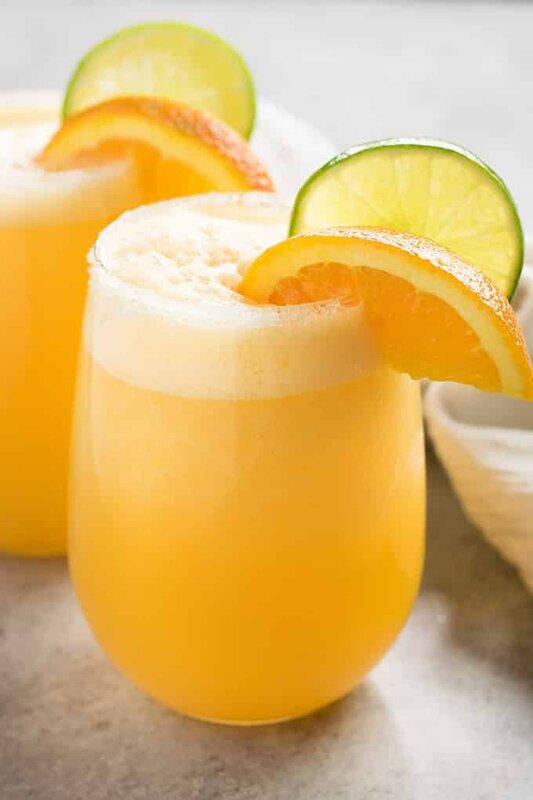 From The Salty Marshmallow :: Click HERE for the RECIPE Frosty Orange Margaritas – A sweet change up to traditional margaritas! 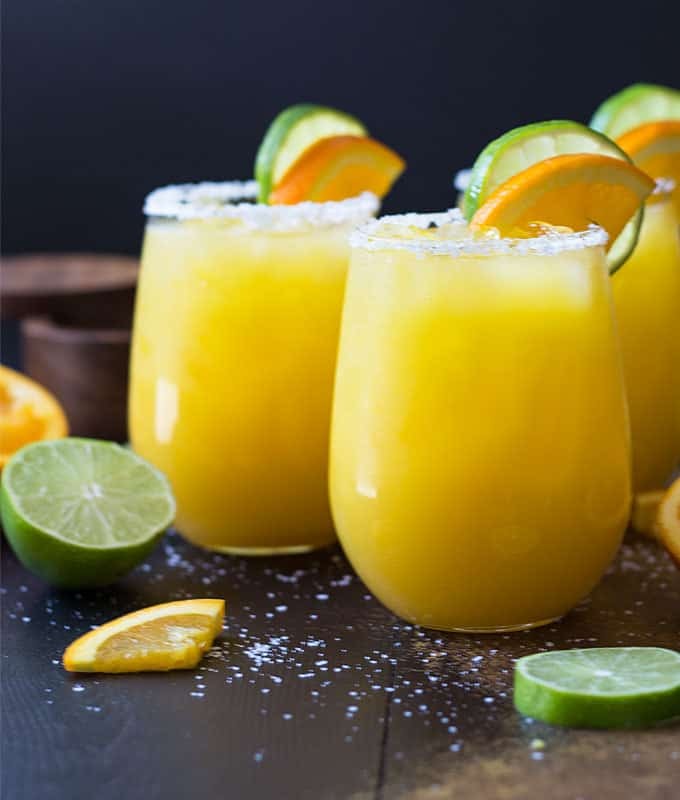 These orange margaritas are super quick and easy to make, perfectly sweet with fresh orange juice, and amazingly refreshing. From House of Yumm :: Click HERE for the RECIPE Bellini Margaritas are the perfect brunch cocktail! A mixture of a bellini and margarita! Made with peach juice, tequila, and champagne! From With Salt and Wit :: Click HERE for the RECIPE A tropical spin on the classic drink! 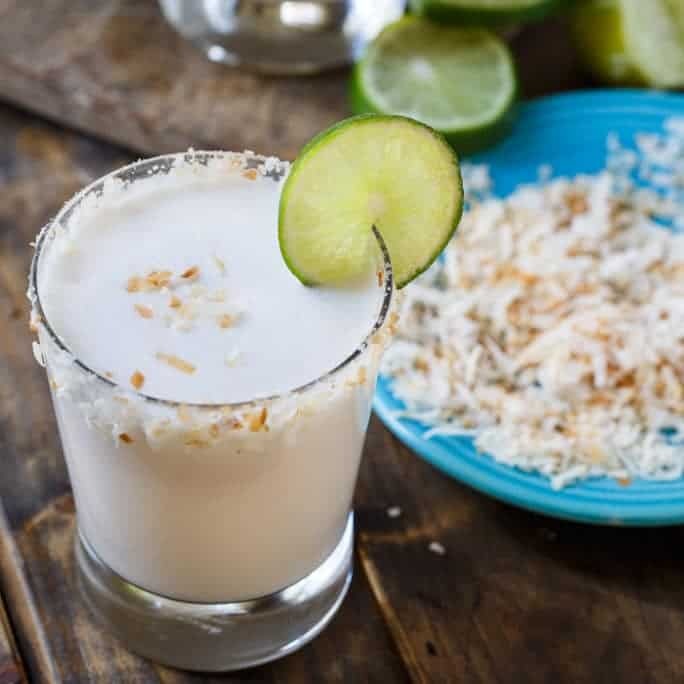 These skinny coconut margarita are made with lite coconut milk, coconut water, tequila blanco and triple sec for a refreshing cocktail! 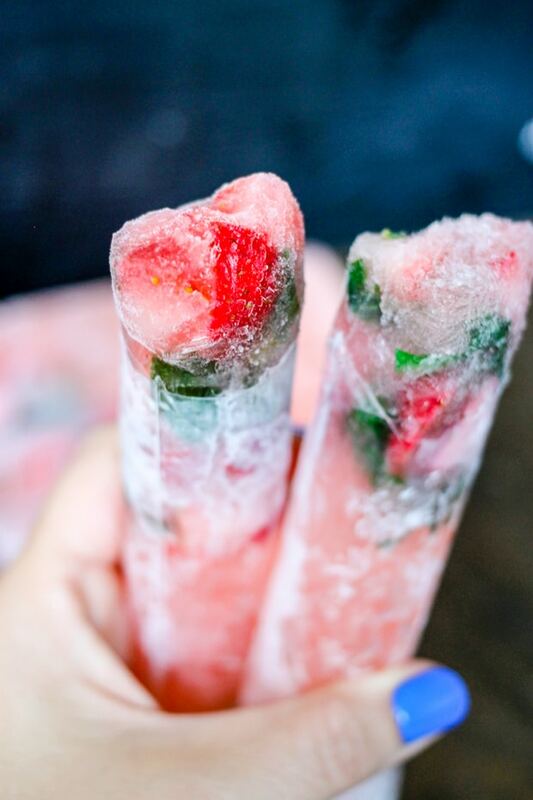 From Domestic Superhero :: Click HERE for the RECIPE Strawberry Basil Margarita Popsicles are not only boozy and delicious, but they are simple to make! Everyone is going to be begging for this alcoholic popsicle this summer! 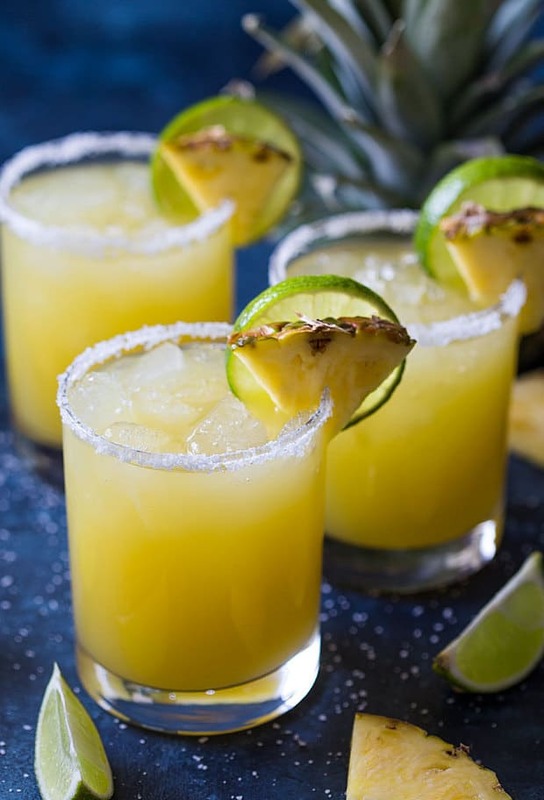 From Miss in the Kitchen :: Click HERE for the RECIPE Pineapple Margaritas are a fun twist on my favorite classic party cocktail. Sweet pineapple with a bit of orange and a twist of lime! 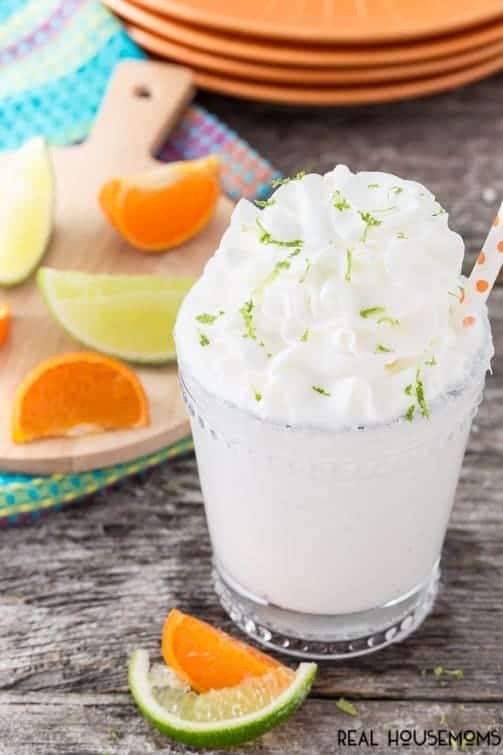 From Spend with Pennies :: Click HERE for the RECIPE Using fresh lime juice (and orange juice if possible) only takes an extra 30 seconds and really sets this drink apart from the rest! 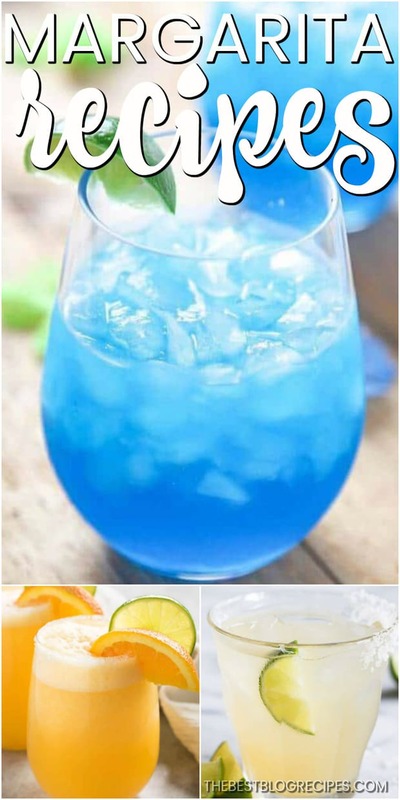 The perfect summer drink! 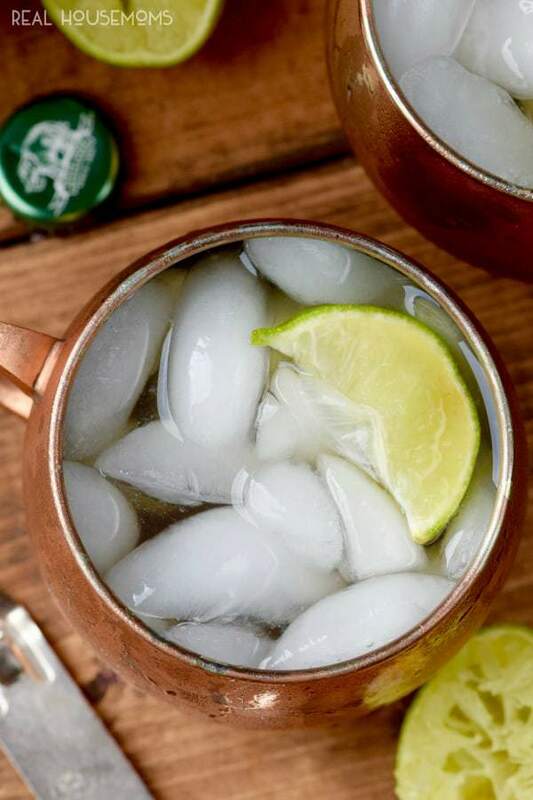 From Real Housemoms :: Click HERE for the RECIPE These Margarita Mules are a perfect combination of Margarita and Moscow Mules to make one amazing cocktail!! 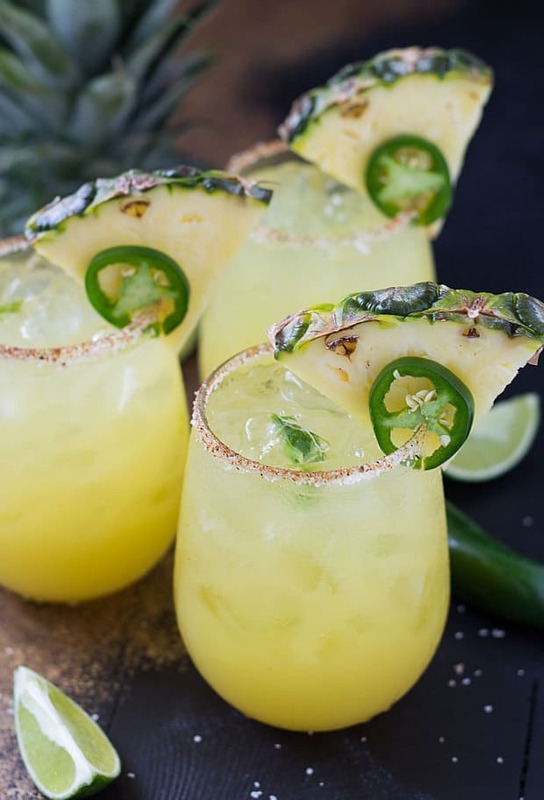 From The Blond Cook :: Click HERE for the RECIPE A muddled jalapeño slice with pineapple juice, triple sec, lime juice and Patrón Silver is sweet, savory, tart… and well… just absolutely amazing! 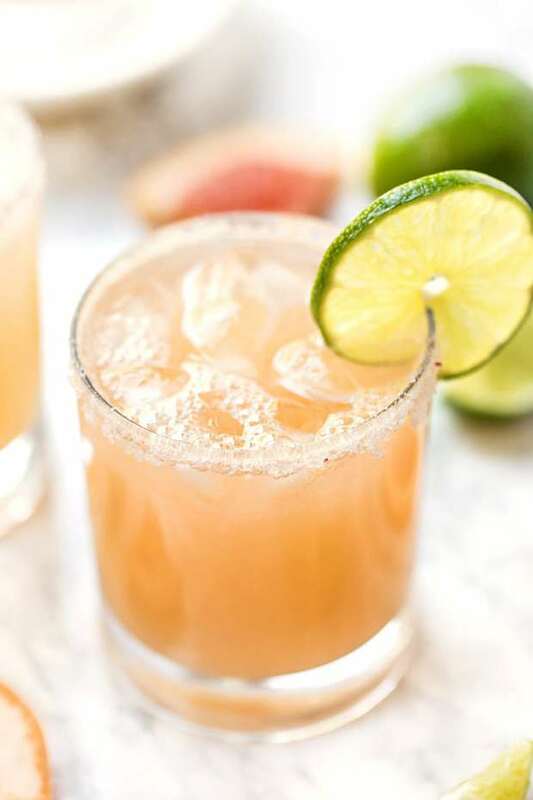 From Simplu Quinoa :: Click HERE for the RECIPE Healthy Grapefruit Margaritas use just 4 ingredients, are ready in 10 minutes and have NO added sugar! 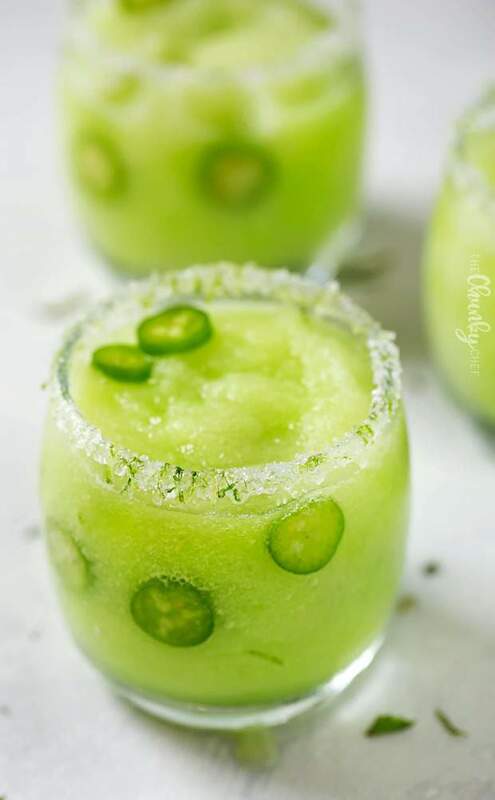 They’re a fun twist on the skinny margarita! From Spend with Pennies :: Click HERE for the RECIPE Delicious and easy to make frozen Mango Margaritas are tart, sweet, easy to customize, and are the perfect cocktail recipe to keep you cool this summer. 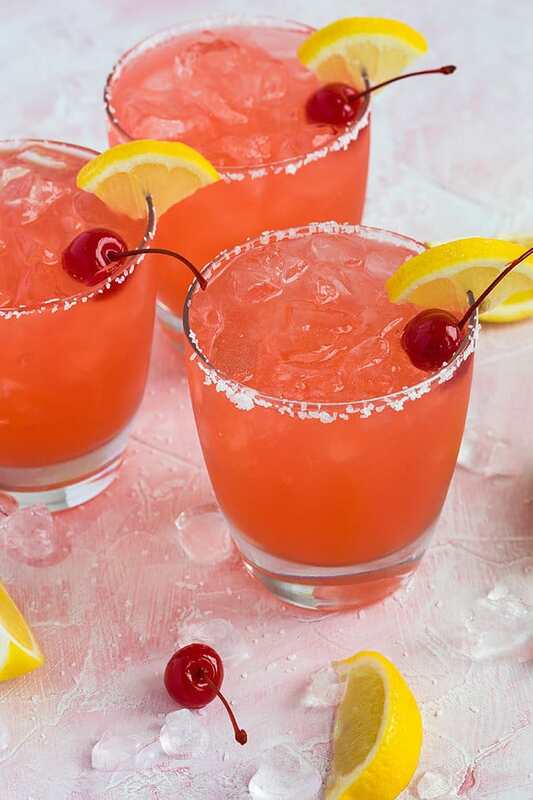 From The Blond Cook :: Click HERE for the RECIPE So amazingly sweet and tart, if you’re a margarita lover (like me), you’re going to love these easy and simple Cherry Lemonade Margaritas! From Noshing with the Nolands :: Click HERE for the RECIPE Tangy and not too sweet is how I like my margaritas! These have the perfect proportions of tequila, lime, Cointreau and rhubarb syrup. 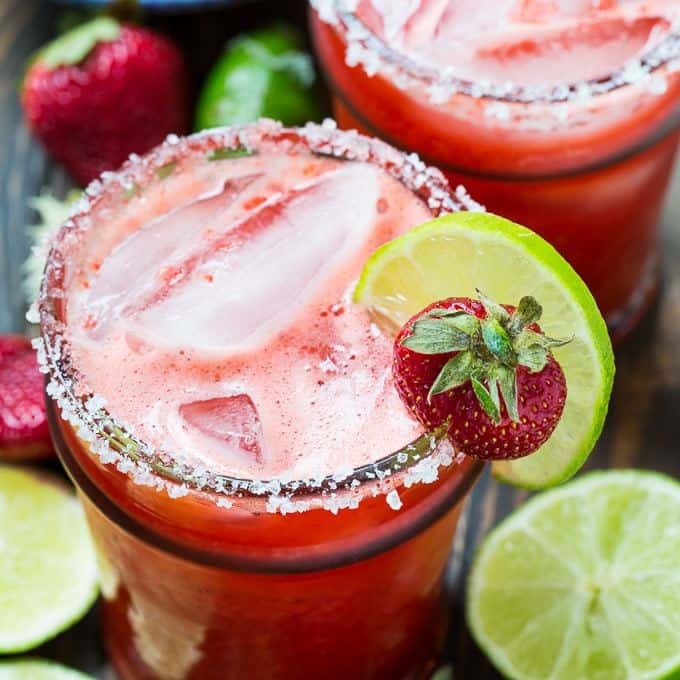 From Spicy Southern Kitchen :: Click HERE for the RECIPE Homemade Strawberry Margaritas made from fresh strawberries, lime juice, agave, tequila, and Triple Sec make a cool and refreshing cocktail that’s perfect for getting a spring or summer weekend started. From Dessert for Two :: Click HERE for the RECIPE How refreshing do these look? 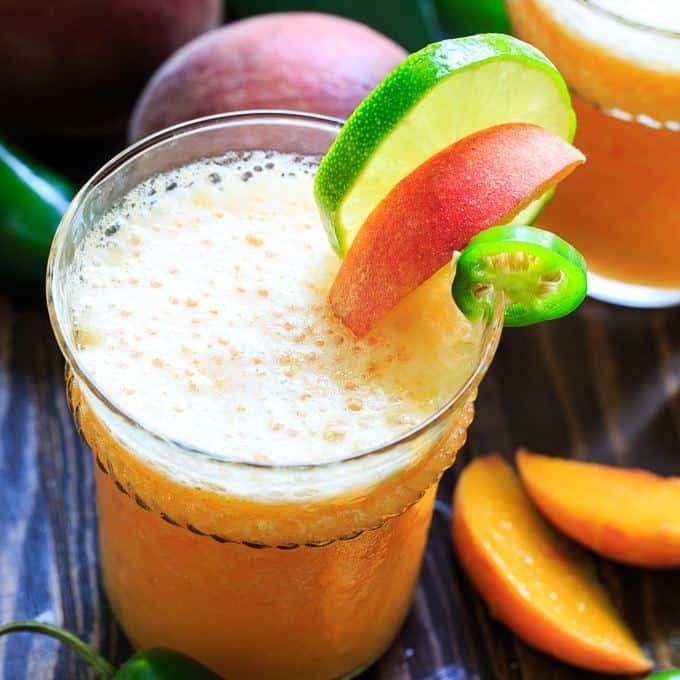 From Spicy Southern Kitchen :: Click HERE for the RECIPE Peach Jalapeno Margaritas are made for summer. They are both sweet and spicy and make a refreshing cocktail for warm weather. 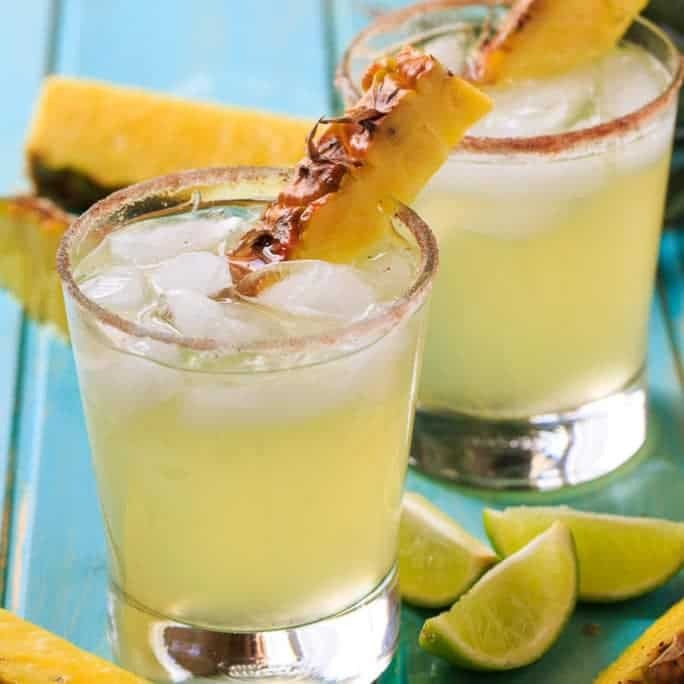 From Spicy Southern Kitchen :: Click HERE for the RECIPE With their tropical flavor, these Pineapple-Cinnamon Margaritas will quench your thirst all summer long. From The Chunky Chef :: Click HERE for the RECIPE I love using fresh fruit like this in margaritas, especially when it’s seasonal and super sweet right now! Honeydew has such a sweet, refreshing flavor, not to mention the gorgeous green color. From Miss in the Kitchen :: Click HERE for the RECIPE Frozen Peach Margaritas are the perfect refreshing cocktail. Simple and easy with just a few ingredients, perfect for parties and weekend get together with friends. 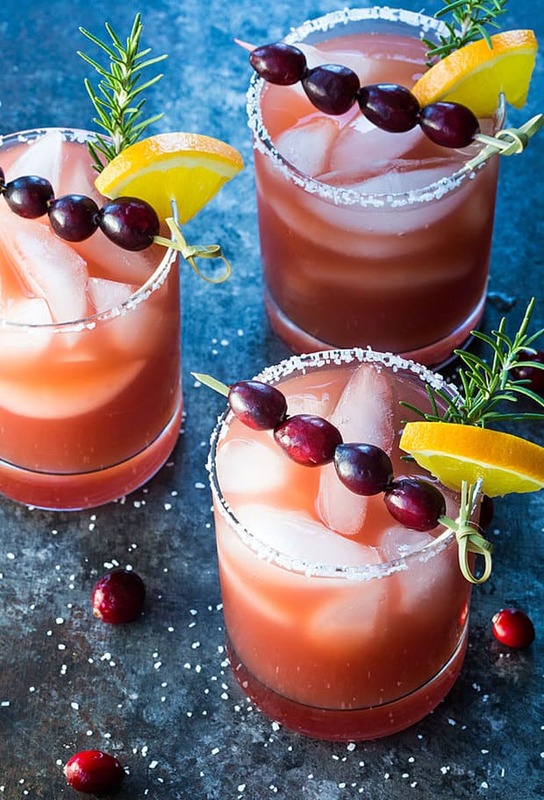 From The Blond Cook :: Click HERE for the RECIPE The classic margarita gets a festive twist in these Cranberry Orange Margaritas I’m sharing today. From Delightful E Made :: Click HERE for the RECIPE An amazing way to enjoy a fresh, delicious margarita! 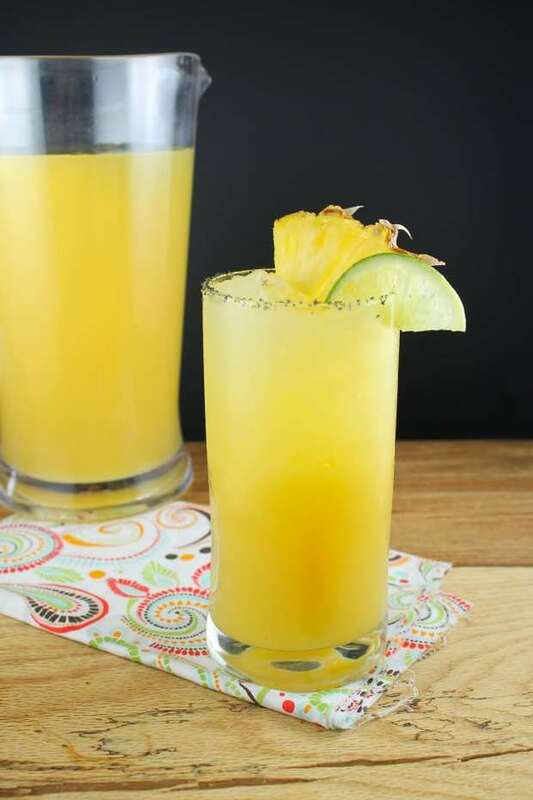 This easy Pineapple Margarita recipe is just 5 ingredients and comes together in moments. Fabulous for your next happy hour or celebrating Cinco de Mayo! 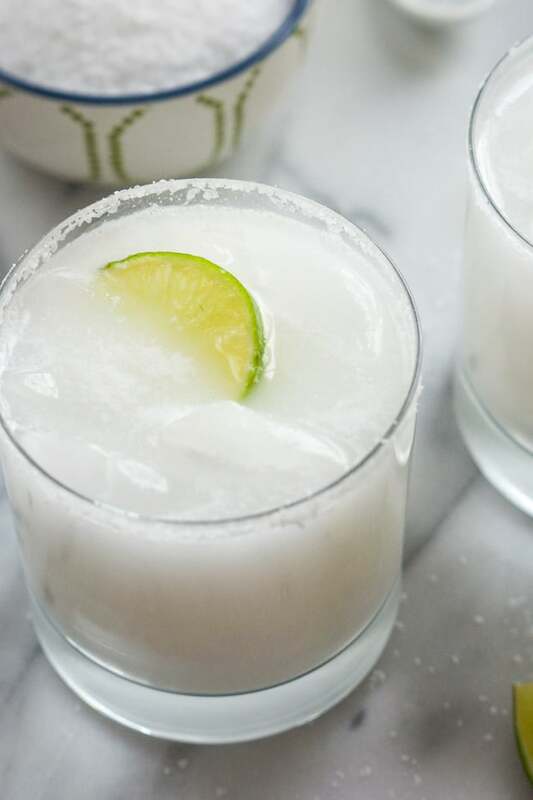 From Spicy Southern Kitchen :: Click HERE for the RECIPE Coconut Margaritas are snow-white in color but taste like a cool and refreshing tropical cocktail. They kind of taste like a cross between a Margarita and a Pina Colada- two of my favorite cocktails. 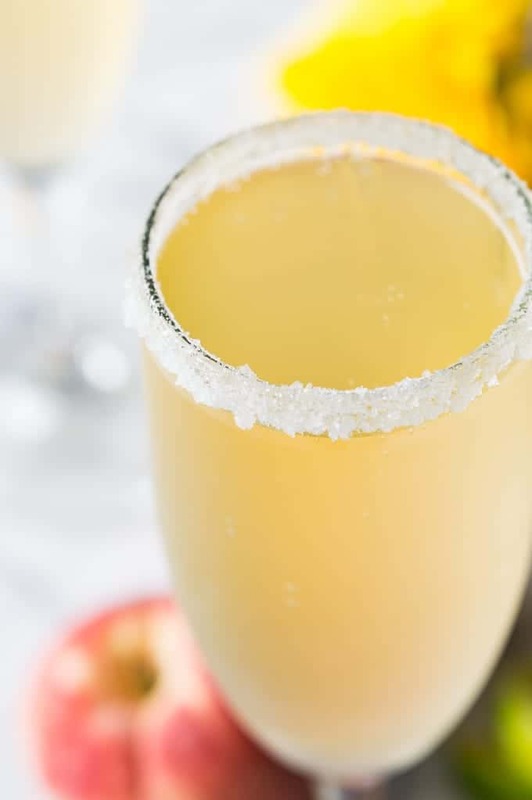 From With Salt and Wit :: Click HERE for the RECIPE Skinny champagne margaritas combine two classic beverages in one bubbly drink! a light & refreshing margarita topped with champagne for an easy and fun twist on the classic! 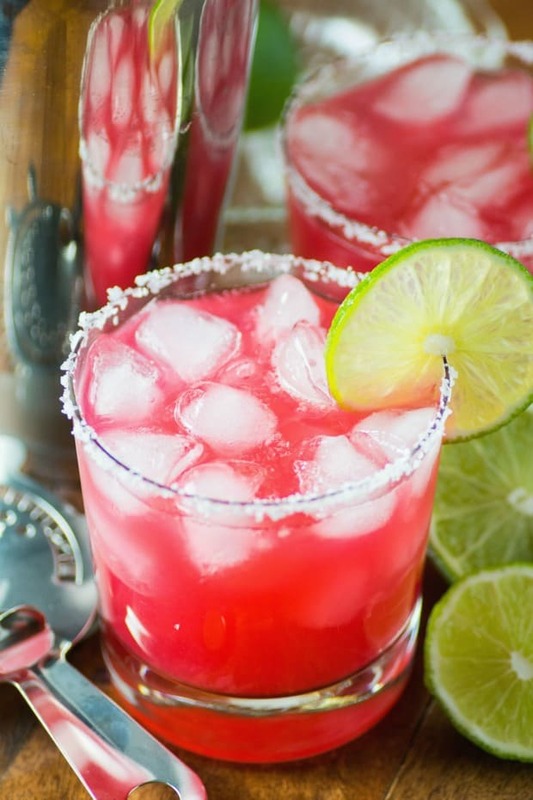 From The Blond Cook :: Click HERE for the RECIPE Who says margaritas are just for summertime?! 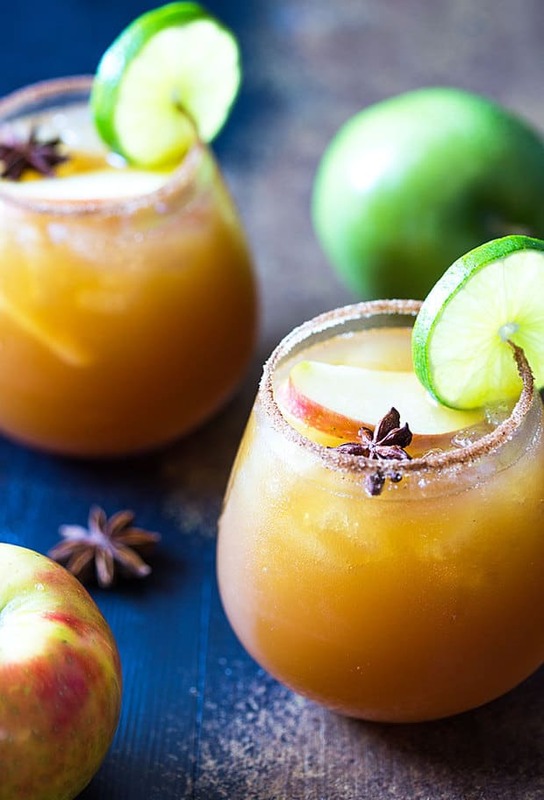 Today I’m sharing a new favorite: Apple Cider Margaritas. 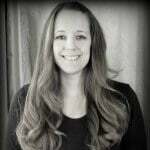 From The Blond Cook :: Click HERE for the RECIPE Sometimes, being a forgetful, scatterbrained blonde has its advantages. That’s how I came up with these Strawberry Beer Margaritas! 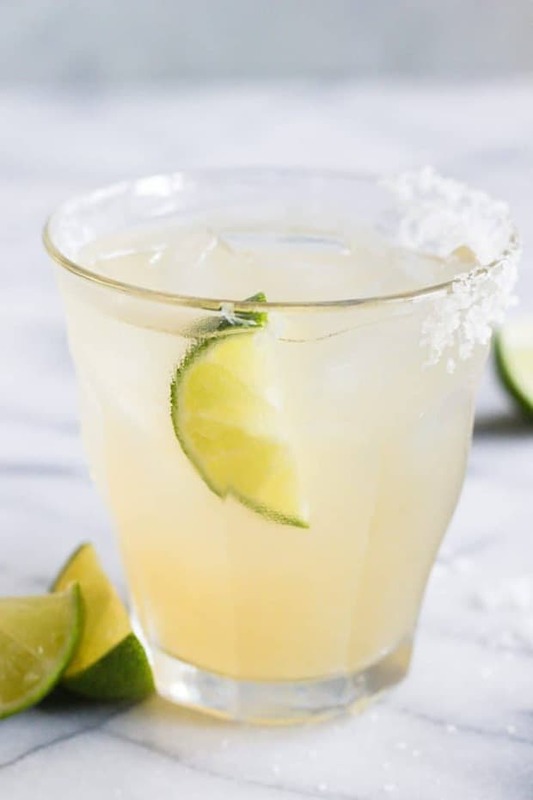 From The Little Pine :: Click HERE for the RECIPE Whether it’s hot, you’re tired, it’s been chaotic, or you just want to chill — sometimes, you just really need a low carb margarita. 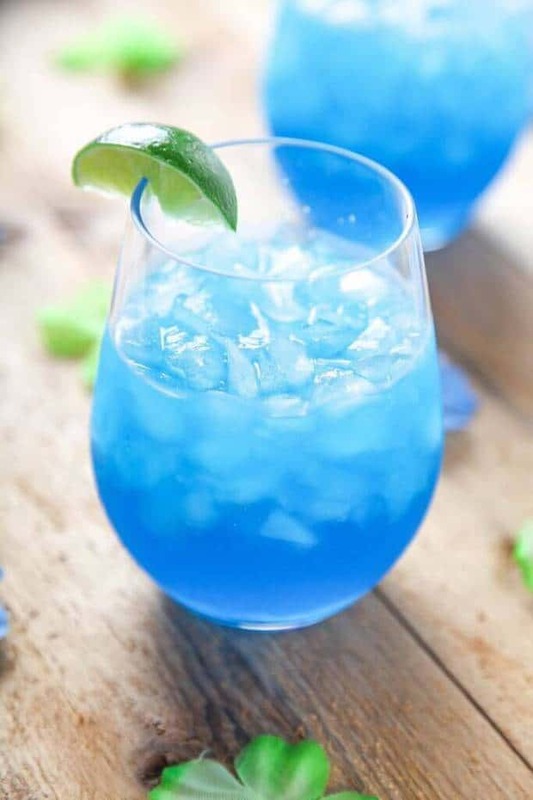 From Dinners Dishes and Desserts :: Click HERE for the RECIPE Blue Margarita Recipe – A pretty blue twist on a classic margarita. So easy to make, delicious, and fun to drink. You can make it by the glass or by the pitcher! 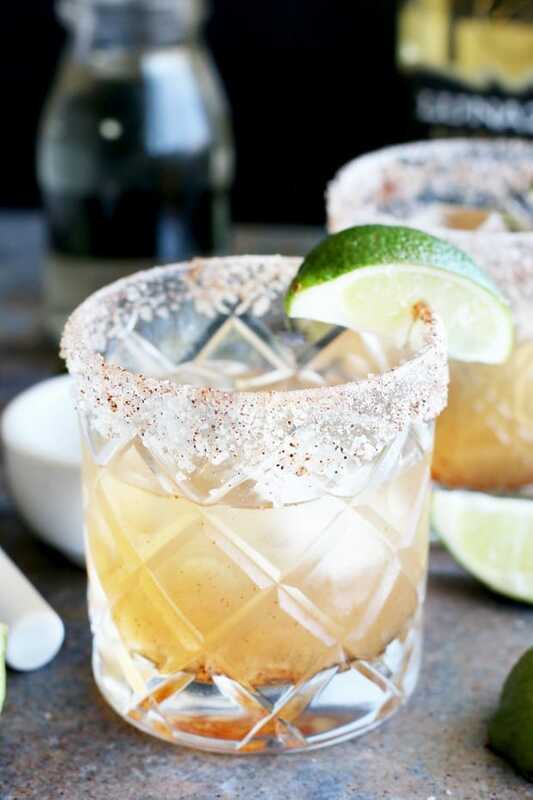 From Seasonal Cravings :: Click HERE for the RECIPE Craving a margarita right about now? Me too! 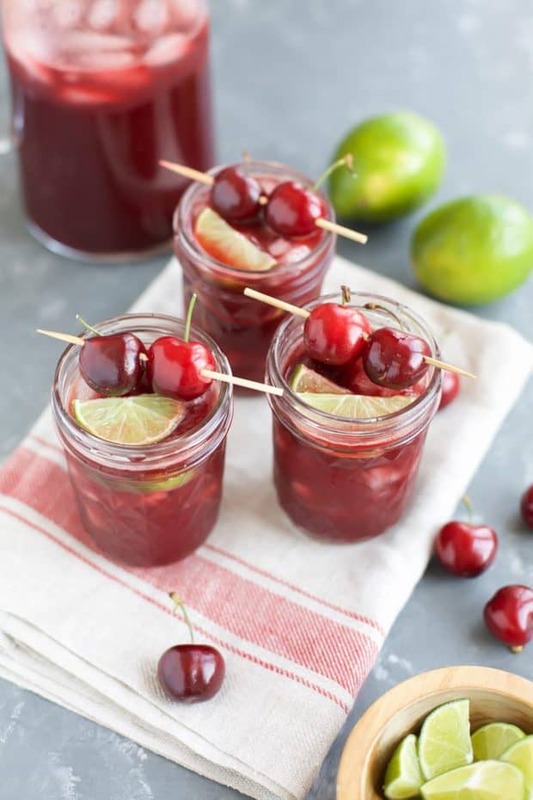 Do it up right with these Cherry Margaritas that are full of fresh lime flavor and are made easily with frozen cherries. 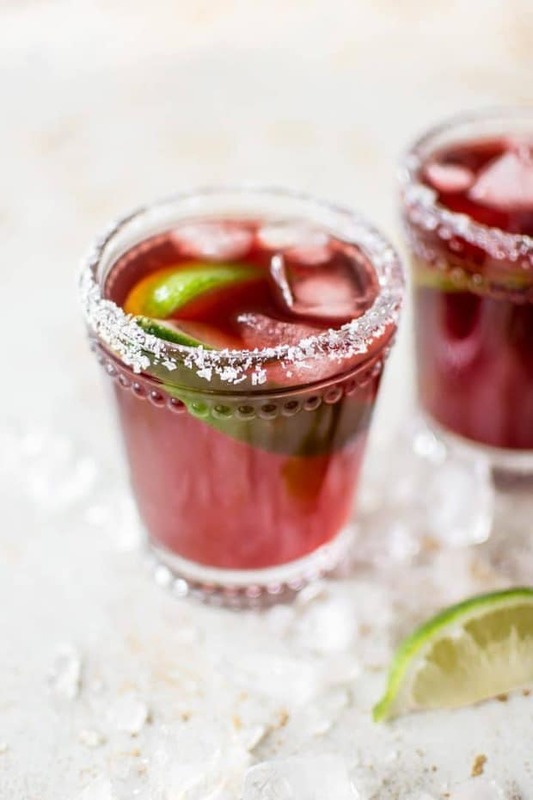 Big batch Cherry Margaritas are perfect for spring and summer parties! 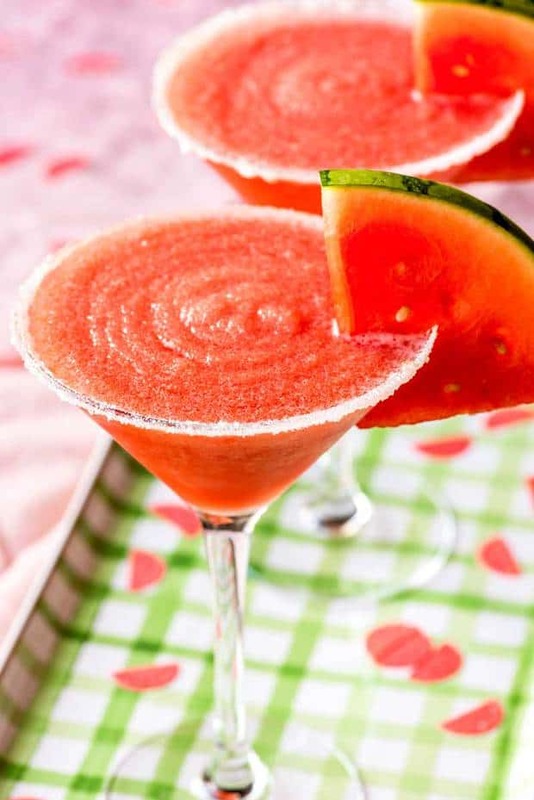 From Homemade Hooplah :: Click HERE for the RECIPE A frozen watermelon margarita is a perfect way to enjoy this summer-loving fruit! Easy to make and deliciously sweet, this drink can be made in advance and does not include ice so it will never water down! 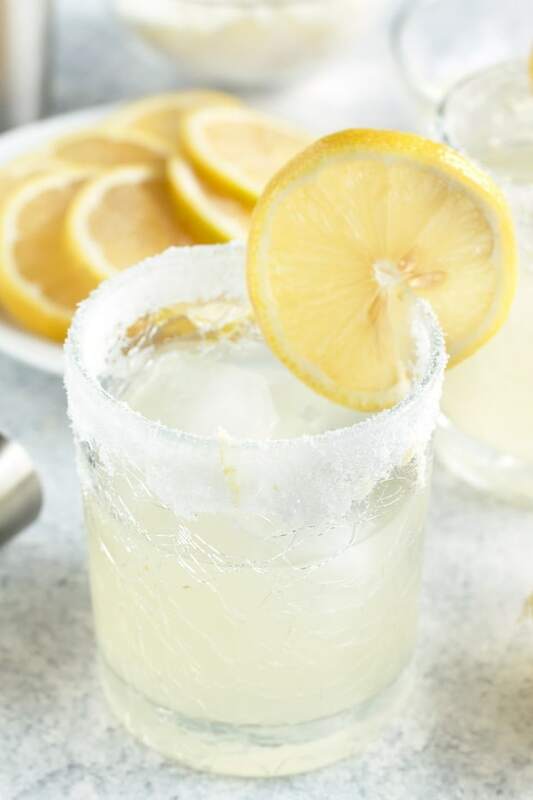 From Cake n Knife :: Click HERE for the RECIPE A Lemon Agave Margarita is a bright and citrusy take on the classic margarita, but without that pesky over-sweetened margarita mix. Made with fresh lemon juice and agave, this margarita is fresh and vibrant. Plus it can be rimmed with salt OR sugar, depending on your mood! From The Blond Cook :: Click HERE for the RECIPE Oh. My. Word. 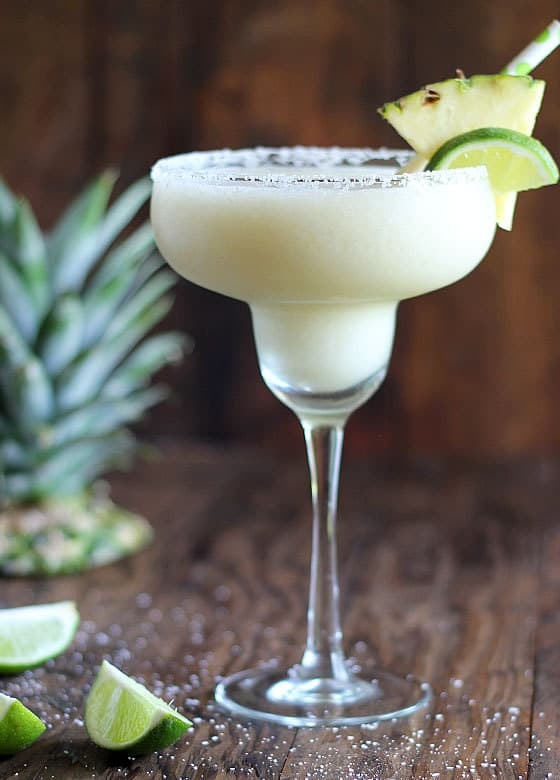 This Frozen Coconut Pineapple Margarita is going to be your new go-to frozen margarita… and it’s SO EASY! From Real Housemoms :: Click HERE for the RECIPE This Margarita Milkshake is for the adults! Enjoy anytime you want a cool, refreshing tasty beverage with a kick. It doesn’t need to be 5 i’clock! 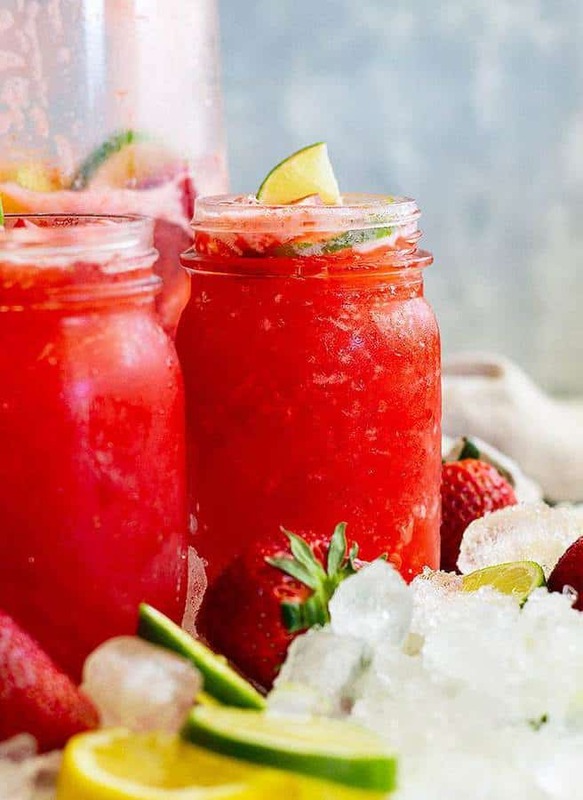 From Spend with Pennies :: Click HERE for the RECIPE Refreshingly cool and incredibly frosty, Strawberry Margaritas are my go to summer drink! All you need are a few simple ingredients and a blender. Once blended you can enjoy these right away or store them in the freezer as a make ahead cocktail that’s ready when you are! 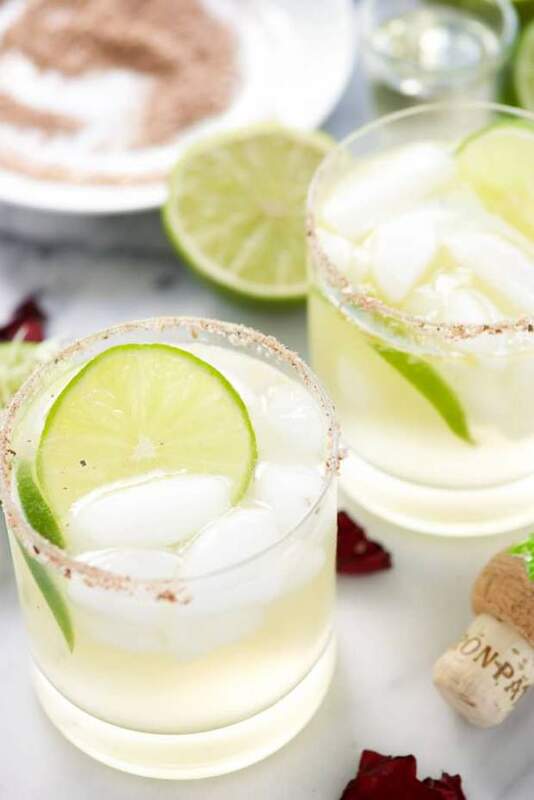 From With Salt and Wit :: Click HERE for the RECIPE Spice your margarita with this Spicy Rosa Picante Margarita for Patron Margarita of the Year! Fresh lime juice, ginger, a bit of jalapeno and rose water make this one top shelf margarita! 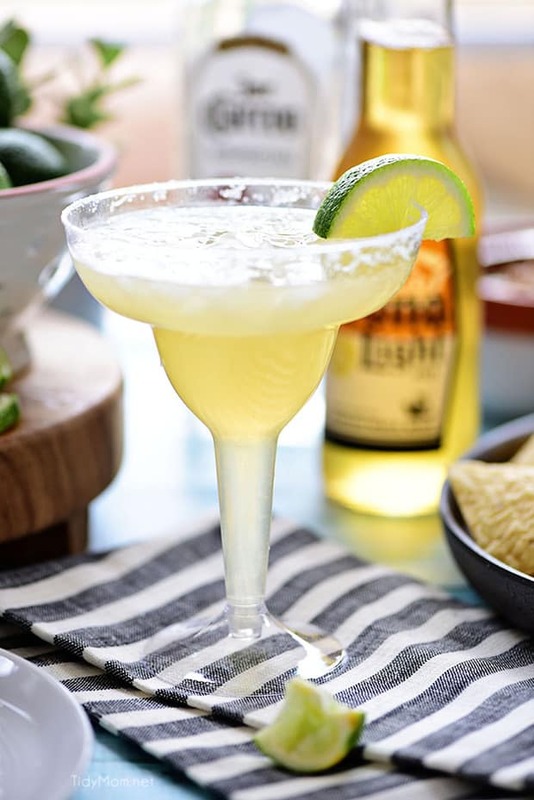 From Tidy Mom :: Click HERE for the RECIPE This easy recipe for a Beer Margarita has only 3 ingredients and is dripping with Mexican flavors. Just in time for Cinco de Mayo, game day or your summer sipping pleasure. 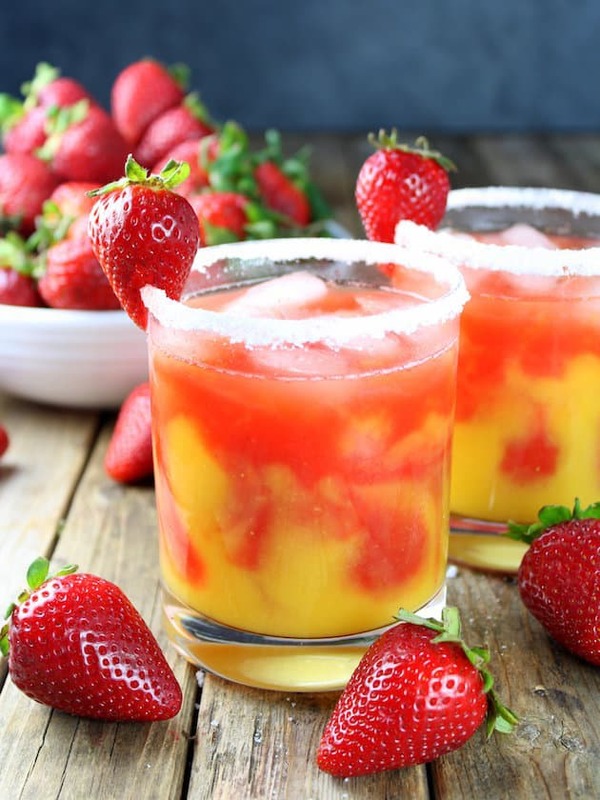 From Taste and See :: Click HERE for the RECIPE Honey Mango Strawberry Margarita – fresh, fruity, boozy and delicious! 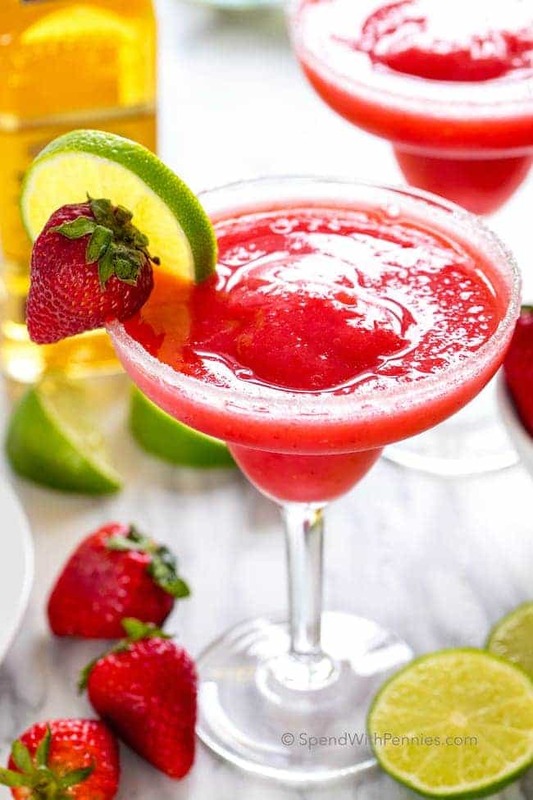 With fresh strawberries and honey mangos, lime juice, tequila, Cointreau and strawberry liquor.